Camping out is a great way to experience the Canadian Rockies, and you’ll save some money to boot. This itinerary works for both tent campers and those who have their own or a rented RV (recreation vehicle). It’s important to remember that not all campgrounds have powered sites or accept reservations. This itinerary starts and ends in Calgary. Spray Lake, Spray Valley Provincial Park. Turn down Highway 40 as you travel west from Calgary to Kananaskis Country. 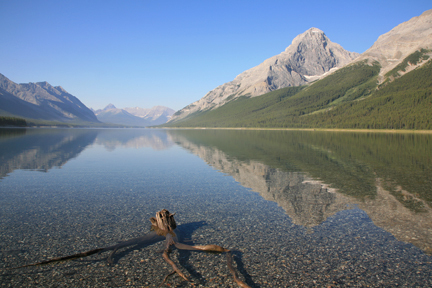 Spend the night in Peter Lougheed Provincial Park. Plan a leisurely hike to Rawson Lake (pack a fishing pole). Head north, traveling via Spray Valley Provincial Park if you’re not put off by unpaved road. In Banff, stay at Tunnel Mountain Campground if you want to walk to town, otherwise head to Two Jack Lake Campground. Beat the traffic by rising early for the drive to Lake Louise. Stop at Johnston Canyon for a short walk to a tall waterfall. Snag a spot at the Lake Louise Campground before noon, then spend the afternoon visiting local attractions. Rise before dawn to catch Moraine Lake at its most pristine, then begin the trip to Jasper along the Icefields Parkway. Choose to camp en route or continue to the campgrounds spread along the highway south of the town of Jasper, including Whistlers Campground. Spend the morning exploring Jasper attractions like Mount Edith Cavell and Maligne Lake, then head back through Lake Louise to Yoho National Park and pitch your tent for the night. Drive to Golden and enjoy lunch at the top of Kicking Horse Mountain Resort. Drive south to Radium Hot Springs. Stay at one of the commercial campgrounds near town or continue on into Kootenay National Park and set up camp there. Before returning to Calgary, make a stop at the Paint Pots, one of Kootenay National Park’s most unusual natural wonders.